I'm guessing most of you are gearing up for your Christmas celebration, while we are winding down from it! Not to worry, we still have a big Christmas Eve soiree at my parents' house, but we had our own big Christmas party/ dinner at our house on Friday night. Matt's parents were in town for a few days, and my family came over to join in on the fun. And they were all my guinea pigs, because I decided to make a new cake and it was a big gamble! I love Christmas - it's my favorite holiday of the year. For me, it means a more relaxed time with less travel, the horses get a little vacation, and family and friends all come together when during the rest of the year, we're often too busy. The mail is full of good tidings, the kitchen always has an assortment of deliciousness available (oink oink), and lights twinkle from houses around the neighborhood. 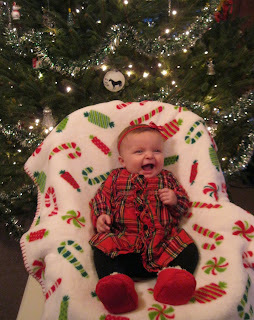 This year was extra special with a little girl, experiencing her first Christmas and all the fun that goes with it. She may not understand it all yet, but she was loving the attention and the party atmosphere the other night. In fact, she refused to go to bed - she insisted on coming back out and chattering with our guests until they all went home! In fact, she's still winding down from the excitement two days later, she's a pistol. Ok so I look a bit weary but you can also see my wine glass was empty. Doesn't Lyra look cute? So here's my gift to you....I hereby present the Candy Cane Cake. With modifications. I'll post the original recipe, and then will add my two cents and changes below. I needed to make it easier and tastier, in my opinion, but mostly easier. Hello, I have an infant and a full farm. How was it? Delish - I had raves from everyone. Everyone except Matt, who muttered as the cakes were cooling..."I'm not really a peppermint guy." In the true spirit of Christmas, I serenely replied, "Tough noogies." From all of us here at TMF, we wish you a joyous holiday and a fantastic 2013 ahead! BEAT first 6 ingredients in large bowl with mixer until well blended. Stir in chopped chocolate and 2 Tbsp. crushed candy. Pour into 2 (9-inch) round pans sprayed with cooking spray. BAKE 35 to 40 min. or until toothpick inserted in centers comes out clean. Cool in pans 10 min. Loosen cakes from sides of pans; invert onto wire racks. Carefully remove pans. Cool cakes completely. FILL and frost cakes with COOL WHIP. Sprinkle with remaining crushed candy just before serving. Keep refrigerated. As you can see from my photo, I nixed the crushed candy canes in favor of whole candy canes in heart formation. I figured not everyone would want a ton of peppermint, there was plenty within the cake itself. Also, the candy canes do melt into a puddle of red and white goo, so once your guests have left and you have some leftover cake, remove the candy canes and give them to me. The horses love them! Ok, here's the vanilla frosting. I stopped everything I was doing to burst into the living room where Matt, Lyra and his parents were sitting and I exclaimed, holding the beaters, "You have GOT to try this!" They all looked at me like I had six heads, and then they sampled it. I do believe the leftover frosting in the bowl was mysteriously cleaned out before I washed it....and it wasn't me! Reduce speed to medium. Add the confectioners' sugar, 1/2 cup at a time, beating well after each addition and scraping down sides of bowl as needed; after every two additions, raise speed to high and beat 10 seconds to aerate frosting, then return to medium-high. This process should take about 5 minutes. Frosting will be very pale and fluffy. Add vanilla, and beat until frosting is smooth. If not using immediately, frosting can be refrigerated up to 10 days in an airtight container. Before using, bring to room temperature, and beat on low speed until smooth again, about 5 minutes. It goes without saying that we all have been affected by the tragedy that occurred in Newtown, CT. For me, it was too close to home - literally. My mom and dad's house is a few short miles away, mere minutes. The town of Newtown and the hamlet of Sandy Hook is lovely - friendly, warm and the last place you would imagine such horrors happening. It was, really, the last place on Earth that a tragedy of this magnitude would happen. But it did. The Sandy Hook area was a place I frequented - diners, barns, shops and restaurants. Matt and I had breakfast in Sandy Hook the morning after our wedding, discussing our upcoming honeymoon and blissfully recounting the events of our wedding day. I have friends who have children that attend Sandy Hook Elementary and are fine, thank goodness. I have friends who lost family members and friends last Friday. There are too many connections, too many lost. I heard about it on the radio, on my way to the doctor for Lyra, who had a little bug and I wanted to make sure all was well. Once we were home, I just held on to her all day, and didn't want to let her go at night. I get it now. I hurt for the children, but especially for the parents who now have to live their lives without their own babies. The face I kiss at least a hundred times a day. As we all try to get back to some sense of normalcy (though this will stay with me for the rest of my life), there are moments of pure love all around. A farm near Sandy Hook that I began my competitive riding career at offered free pony rides, hugs from the horses, and horseshoe painting for anyone who needed to find comfort. Golden Retrievers have been walking the streets of town, graciously letting anyone cuddle and pat them, giving off a calming feeling. And everywhere around, people are undertaking 26 Acts of Kindness to honor those bright lives that were extinguished far too soon. Matt and I talked about it, and we'd also like to take part in making the lives of others just a little bit better. 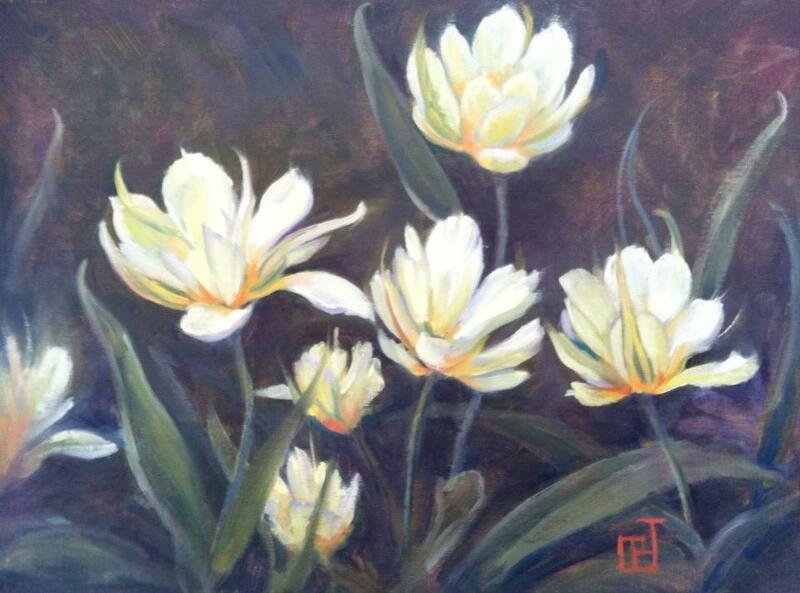 If you'd like to help in other ways, please head over to my friend Ann Leary's blog. She posted some wonderful information about ways to give to the families and those directly affected by the tragedy. I think if we all come together, we can make some light from this horrible, horrible darkness that has overcome our community. Yesterday I had the great pleasure of lunching with a new friend, Carol Brightman Johnson. 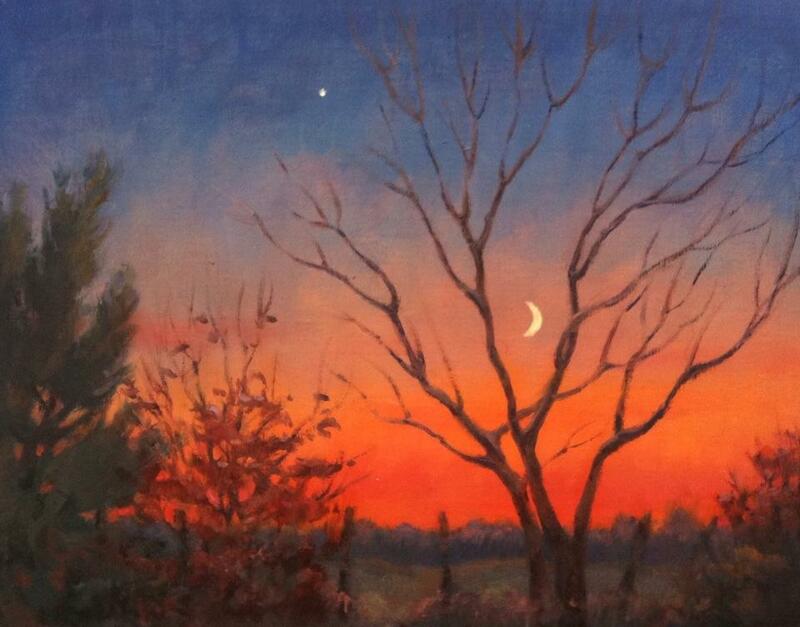 Carol is a kindred spirit....an animal lover, horse owner, and a funny, witty, talented lady. She invited Lyra and I over to Marty's Cafe in Washington, CT, to see her latest art show - benefiting the Steep Rock Association. Steep Rock was the inspiration for many of her paintings in the show, and I got the chance to see them in person, and get to know this lovely lady a little better. Carol greeted us with a giant smile and warm hug, and she immediately spent some time talking to Lyra, who was fascinated with this new person! Lyra really enjoyed taking in the new surroundings....until the cappuccino machine started sputtering. That was not a popular drink choice, in her opinion. 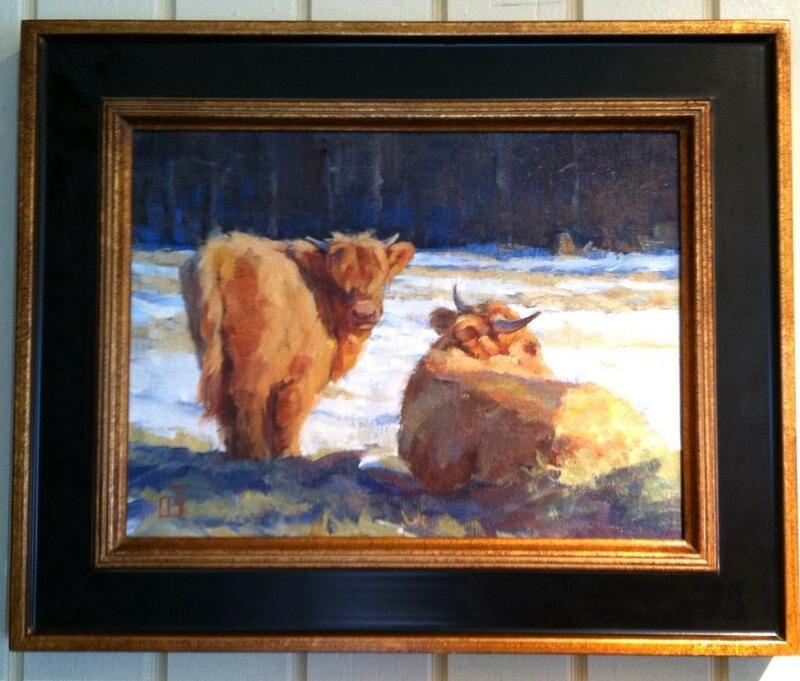 I immediately asked Carol to give me the grand tour, and we went around to look at all of her beautiful work. 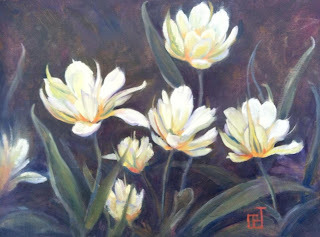 What struck me with each painting was the sense of familiarity and warmth every piece evoked, and the attention to detail. Each leaf, fence post or tree branch was accounted for and seemed to tell part of a story. 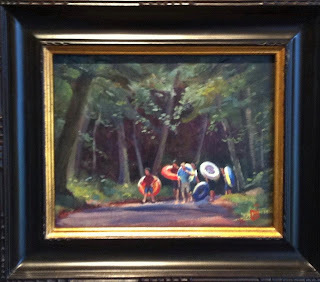 My favorite - "An Evening in Autumn"
I loved that the paintings with people or animals had a breath of life to them - the animals had personalities and the people had a glimmer of mischief or propriety in their eyes, depending on who they were and what they were thinking at the time. She also had beautiful florals, with bright and lively petals and earthy greens and browns pulling it all together. I almost wanted to reach out and touch the texture of the painting, but held myself back! We had such a good time chatting over lunch, and Lyra decided to doze off so I could eat with one hand...until the cappuccino machine struck again! But while we were there, another couple sitting near us kept asking about one of the paintings over our heads. Then they'd murmur to each other, and practically lean onto our table to examine it again. 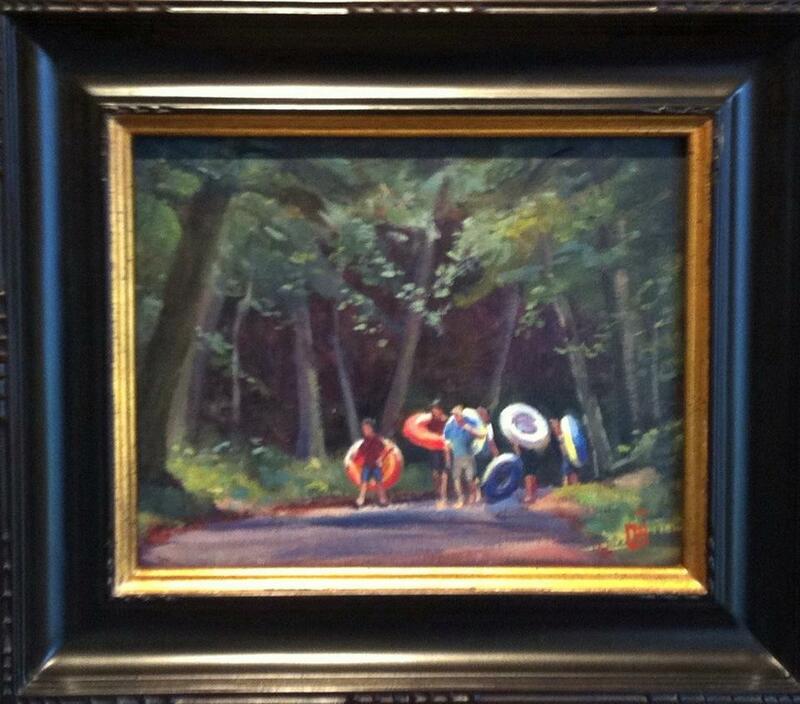 "Let's Go Tubing" - SOLD! It was sold within a matter of moments! If you have the chance, I highly encourage you to head over to Marty's in Washington Depot, CT - you won't be sorry. It's a lovely exhibit and who knows? You just might be enjoying some coffee and a croissant next to the accomplished artist herself. I think most of you know our family is a bit unorthodox. Well, we are. Even Lyra prefers to march to the beat of her own drum. Most babies roll from their bellies to their backs. Lyra doesn't. She is convinced she's a ninja in training and will do some crazy yoga positions to roll from her back to her front. She loves when we speak in "death metal" tones to her instead of cute baby coos. Unorthodox. So it comes as a surprise to no one (I hope) that we didn't serve pumpkin pie at our little Thanksgiving. I made a frozen concoction that's delicious and sinful. I've had a few requests for the recipe, so without further ado, here it is....the Thanksgiving Cappuccino Pie! But first, here's a picture of the completed pie. I started drizzling chocolate syrup on top and then decided halfway through to make the syrup resemble a turkey. How'd I do? I can't take credit for the recipe, I just got it from my mom! The artistry on top though, is all me. Stop laughing. Seriously. It's hard to draw in syrup. Beat cream cheese with an electric mixer on medium speed until fluffy, about 3 minutes. Add condensed milk and 4 Tbsp chocolate syrup. Beat on low speed until well blended. Dissolve coffee powder in hot water. Stir into cream cheese mixture. Fold in whipped topping. Pour mixture into crust, cover and freeze overnight. Once frozen, drizzle with chocolate syrup swirls and dollops of Cool Whip, if desired. Let pie stand in refrigerator for about 15 minutes before serving. I hope your Thanksgiving weekend was as much fun as ours! We had a quiet holiday - Matt still had to work, although from home, and has for years - so usually, it was just the two of us. It was extra special this year though, because it was Lyra's first Thanksgiving! She had no idea - but we made sure she knew we were thankful for her this year. Everyone got a holiday - horses, too. Of course I made a delicious turkey dinner, just for the three (two) of us. We decided to try out Lyra's high chair so she could be a part of the dinner, and while she was still too small for it, she seemed to like watching us eat! The best part was the frozen cappuccino pie...delish! Black Friday was far from it, as the weather was beautiful and you won't find me near any mall or store. No thanks. 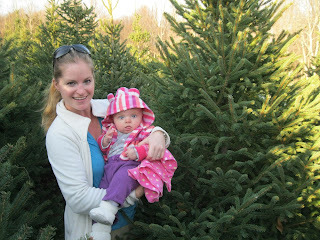 We decided to go tree hunting instead, making the most of the warm day. So off we went to Windswept Farm, and cut down our tree! Lyra didn't really care what we were doing, but I think she had fun. All of this was capped off with the big clinic on Sunday with Phillip Dutton. I was a little nervous - it was Zeus' first clinic, and his first time in an indoor arena. I didn't need to worry. Phillip was wonderful working with Zeus and I and complimented our flatwork, effective leg yields and transitions. Then he put us through some exciting and really challenging jump exercises. I can't wait to start replicating them here at home to make Zeus and I even sharper and more skilled over the winter (video)! All in all, it was a very memorable weekend, with a perfect blend of relaxation, excitement, and copious amounts of food and wine! Bring on the Christmas cheer! I was at lunch today with a dear friend who (lovingly) pounded her fists on the broad wooden booth and said, "WHY do you not post to your blog?!" Most of the time....here's why. Man, she's cute. Here's another one from this morning. Anyway, we've been really busy around these here parts...I mentioned to my friend that I should do a photo blog of "A Day in the Life." It seems like I'm constantly running to and fro between horses and baby, hence, no time to blog. But I'll make a better effort, as long as Lyra takes better naps! Zeus and I spent a large part of our fall season in lessons and riding in hunter paces. Here we are coming to the finish of a hunter pace last weekend. 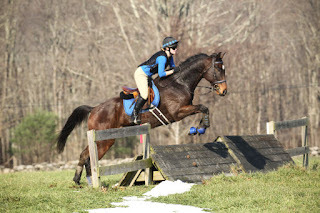 Note the snow still on the ground...that made for a fun trailering field. A wee bit slippery! This weekend, I'm super excited to be riding in a lesson with the legendary Phillip Dutton. Who is he? Oh, just a two-time Olympic Gold Medalist, that's all. I can't wait to see what winter homework I can glean from Phillip, or PDutty, as some eventers call him. Actually, I don't even know if he likes that. He might not, so I better not blurt that out on Sunday. After that, we'll settle in for the long winter months, riding when we can and enjoying the chilly but brief respite from running constantly. On that note, I'm off to the next thing while I still can, before the Little Diva wakes up! There's a smart, cunning female that lives at the farm. She's blonde and has a voracious appetite. She's begun a new nightly ritual. Our larger horses get some extra food at night check since they get a larger volume of grain. Topaz is not happy with the fact that they get a third meal of grain at 10 PM and she doesn't, so she's figured out a way to get some of her own. You see, she discovered that if she antagonizes Zeus - squeals, runs her teeth along the stall bars and bucks in place (pony temper tantrum) Zeus retaliates, usually with a mouth full of grain. And after that...well, you'll see. Oh, us girls. The things we'll do for good food. Speaking of, I'm off to have some chocolate. At least I don't have to run my teeth along steel bars....right? Well, once again it's been ages since I've blogged. 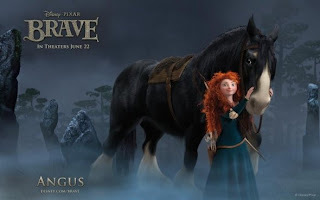 How has it been going around here with Lyra and the horses, you ask? Well, let me tell you. It's insane. But totally awesome. I'm tired at the end of every day, but it's a good kind of tired. Adding a baby to a busy farm has required a few adjustments around here. When Matt's working, Lyra's awake and I have to feed the horses, we have to form a baby - mom - grain convoy. Egads, pay no attention to the outfit! Keepin' it classy. It's a good thing I can pilot a baby and buckets of grain with one hand each...love the ancient Radio Flyer wagon! Then, before she was sleeping through the night (yes, she was doing her nights at around 2 months, I am so proud of this little gem), on occasion she'd have to come to the barn to do night check with us. The Manly Bjorn! This thing rocks! She's actually in front of me hanging out in it while I type this entry...! While it takes a lot longer to get things done when she's in tow, at the heart of the matter...well, she is the heart of the matter. How can she not be? Back to horsey things. Zeus and I completed our first competition of the year yesterday, a hunter pace with Splash and his owner. What a blast! There were lots of tricky jumps on course, and Zeus stormed over them all - including an upturned boat, water crossings and giant rolled hay bales. We compete over the next few weekends before calling it a season. Zeus schooling at the park - obviously overachieving. And then runs like a lunatic afterward. Hello, where are the brakes on this thing?? Lyra didn't come to the pace this weekend, but for the next 3 weekends she's got dates at shows and events, and a whole cavalcade of people to fawn over her. Zeus will have to get used to sharing the limelight! The phrase "Life's not fair" has never been more true than it is today. Mojo, our treasured NJ rescue cat, mayor, farm mascot and indoor/ outdoor cat, has left us for bigger mouse hunts and filet mignon in Heaven. When we first met Mojo, he trotted up the porch steps to our apartment in Fort Lee, NJ, looking a bit hungry but very, very friendly. We had guessed that his prior owners had moved and made the terrible decision to leave him behind. I was late for work because I went back upstairs to get cat food, and afterward he followed me down the street, almost all the way to the bus stop. He also greeted Matt at the door when he left for work later that day. A few weeks later (and a mean post-it note from a neighbor to not feed the cat...yeah, right), he'd injured his foot badly enough that it was infected, so off to the vet we went. An hour and $400 later, Matt and I decided he was ours. When we bought TMF, Mojo made the move with us and transitioned from urban kitty to farm cat with ease. Mojo always greeted lesson students, the UPS lady, and any and all visitors. He sat on (and sometimes got in) cars parked in the driveway. He particularly loved to jump on a car with an open sunroof and surprise the people sitting in it. He played fetch with snowballs and would lounge around the barn while we mucked in the mornings. He was admired by many for his good looks, and loved by all for his charm. On Friday, Mojo just didn't seem right. Matt took him to the emergency clinic where they discovered a fever and sent him home with antibiotics. He did not improve by Saturday, and that evening we took him back to the clinic, suspecting he had an infection in or near his throat, probably due to getting into a scuffle with another neighborhood cat. The vet thought the same, but we were all sadly wrong. Mojo had a mass - a tumor, most likely - that had grown so quickly that it was obstructing his airway. It was a shock to us because he was only an estimated 7 years old, and never had a breathing problem or seemed lethargic up until Friday. It was clear that his time was coming to a close with us, far sooner than we wanted it to. We made the decision to let him go Saturday evening, and while we are heartbroken, we know we did right by Mojo and made sure he was comfortable and felt loved while crossing to the Rainbow Bridge. We miss him already, and we know the rest of our little TMF family will, too. He belonged to everyone. Although Mojo would say that everyone belonged to him. She's here! Our little girl has arrived. Let me introduce you to Lyra Aurelia. Actually, she's been here for almost 3 weeks - she decided she just didn't want to be a July baby, so she made her debut in June, much to our surprise. Long story short, I was suddenly diagnosed with pre-eclampsia, or toxemia in my 37th week. In layman's terms, my kidneys weren't operating as they should, being potentially harmful to Baby and me. The only cure is to get Baby out, and since we were relatively close to my due date, the doctors decided to induce me ASAP. It was a harrowing experience for both Matt and I between the various drugs I was on, my blood pressure being a roller coaster, I managed to get myself a fever when it came to pushing time, and Lyra had the cord wrapped around her neck - twice! (Clearly this child has embraced her mother's flair for the dramatic.) The delivery was great though, and the end result has been an adorable little package that we're totally infatuated with. She'll either be a pro rider, a gymnast, or a ninja...baby aerobics were a regular thing in utero and she is frequently kicking and kung fu-ing in her bassinet. While I'm sure you're not surprised at all, she's already been out to the barn to meet the horses. Topaz in particular is very interested in her, but in a very gentle way. I think she knows this little lady is the next generation that will learn to ride thanks to her. It's been almost 3 weeks, and I popped on Zeus today for the first time in several months. He was fantastic and while the work we did was very slow and light, it was a moment of Zen for me and a reconnection with all of the moments I missed. While Lyra is worth every second (and hung out ringside with Daddy while I rode), being able to get back in the saddle was an awesome feeling! Time will tell if my daughter follows suit with riding. But whatever she decides her passion is, I think she already knows we're crazy about her. Oh, and how did we come up with the name Lyra, you ask? Well, let me tell you. When we were looking at names, we wanted something unusual but not weird. We also wanted a name we felt a personal connection with. Phillip Pullman wrote a trilogy of books called His Dark Materials, and the first of these books was called The Golden Compass. That may ring a bell, because it was made into a film with Nicole Kidman, Daniel Craig and Sam Elliott (video). Why did this book/ film resonate with us? Well, Lyra's a very courageous girl with strong convictions. But each character, Lyra included, has a daemon - an animal spirit guide that's tied to their soul. Matt and I both think our animals choose us, not the other way around, and we have our own daemons wandering around TMF on a daily basis. On further research, we discovered that Lyra is a constellation and its principal star is one of the brightest in the sky. That's when we were sure it was the right name for our little star. My grandmother Nana (my mother's mother) had a phrase she used often to describe a sneaky person. I can hear her now (usually directed at my brother or me), "Youuuu snake in the grass!" That was right up there with her other favorite, "Oh, for crying in the sink!" On Memorial Day, there was a yelp from the basement. It was Matt, who said, "Mojo has caught the biggest mouse I've ever seen!" Turns out it wasn't a mouse, it was a baby bunny that managed to squeeze between some winter horse blankets and was stunned, but ok. I picked him up and took him out to hop away and enjoy the rest of his life. You're welcome, bunny. You'd think I would have taken some photos because he was so darn cute and cuddly and I half considered asking Matt if we could keep him. Yesterday, I'm washing dishes and happen to see what I think might be a hose on our garage roof. And then the hose moved. Actually, it slithered. This thing had to be approximately 5 to 6 feet long. This is a rat snake, a non-venomous (but yes, biting) snake that is native to our area, though not terribly often seen, from what I'm told. And then being intrigued (or stupid) I wandered closer to get a better look. And it decided to look right back at me. Eeek! Rat snakes are actually great reptiles to have around because they eat - you guessed it - rats, mice and other vermin we otherwise don't really want around. In summers past, we had another rat snake we called Slinky, who would sun himself on the rocks near the stream in the field. Slinky decided life wasn't worth living anymore and got himself hung up in my blueberry bush netting last fall, where he passed away (after several days of us hoping he'd free himself because he was HUGE and we weren't about to try and extricate him). Evidently word got out that TMF was looking for a new resident snake, and thus, Sally Slithers moved into town. And has decided the garage roof is a lovely vantage/ tanning point. You're smarter than me if you can figure out how she got up there. I'm fond of all animals, especially ones that have a purpose, but keep your distance, Sally Slithers. There's no room at the inn for a snake in the house. All season, I've been lamenting the fact that I had to stop riding about 6 weeks ago due to my pregnancy. While looking at my tack, cleaning said tack, and watching others get to actually use their tack, I've been fortunate enough to have a breezy pregnancy that still allows me to teach and even do some XC schools with my more advanced students. I was determined to continue to further my own education out of the saddle during this down time, and was delighted when Boyd and Silva Martin made their return to Fitch's Corner for an annual clinic. What I didn't expect was having the Man, the Myth, the Legend, Boyd himself, chauffeur me around the XC course! If you're not immersed in the event world, who is Boyd Martin? Odds are very good that you'll see him riding in the Olympics this summer. He's making the rest of the world take notice, and you should too. Click here to get just a little caught up. I packed along copious amounts of sunscreen, ice, and a notebook and pen to cover a portion of the clinic for Area I's Optimum Minutes, and off we went. While I'll be detailing more of the clinic itself in an upcoming newsletter for Area I, I was really interested and excited to see his coaching and how he would individualize the clinic experience for not only each horse and rider team's level of experience, but also down to the jump style of each horse and rider. They all came away with a positive, educational experience that pushed boundaries but didn't frighten horse or rider. As each rider successfully completed exercises on varying jumps, terrain, bending lines and changes in canter styles between fences, the spectators would trail along behind the horses to the next section on course. Boyd would say to me, "Get in the cart!" and zoom, off we would go to the next fence! Another spectator remarked to Matt that being pregnant is obviously a perk when attending a clinic with Boyd. I really enjoyed how he discussed, and then improved, the rideability between fences for the horses and riders. He stressed posture and the type of canter or gallop you need before and after each fence to jump cleanly and in rhythm with the horse. As always, Fitch's Corner went above and beyond, giving riders an experience, not just a clinic. Considering the fact that they're hosting the 2012 Area I Championships this year, the riders had a chance to work with one of the best riders in the world, on one of the best courses on the East coast. And while I thought I would be green with envy, it was made just a bit easier to bear by being able to pepper Boyd with questions and have a candid conversation with him, every time we moved to a new area on course. I did make sure to tell Boyd that next year, Matt will be wearing the baby and I'll be riding. Mark my words! The Disney/ Pixar people must have been snooping around the farm here. There is just no other way to explain it. Does anyone look familiar in this photo? 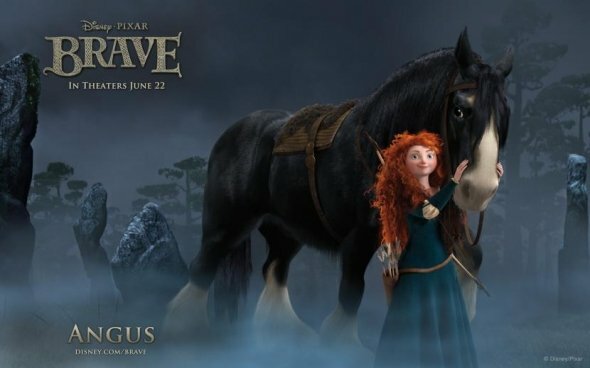 This is a shot from the Disney/ Pixar film Brave, which comes out June 22nd. I would make a terrible redhead, so that's definitely not me. I think you can deduce the other character, though. He didn't tell me that he was in talks to star in an animated feature film, but Snoop clearly likes to keep a low profile.A few weeks ago I heard Matt yell from the living room, "Snoopy is in a movie!" but I'd missed it, and just saw a trailer this morning. I also yelled, "Snoopy is in a movie!" but I was the only one home. The secret's out, Snoop! Say hello to Splish Splash! Splash is a new horse here at TMF....he is a client's horse and has been quite the gentle giant. At 16.3 hands, he's a decent piece of beefcake. Splash is an event and hunt horse, and in his new life here he'll get to enjoy lots of hunter pacing and events, but of course! Topaz is delighted that there is yet another man on campus, just for her to admire. Splash isn't interested, he'd rather be one of the guys. While Snoopy is none too pleased about this new guy in town, there is one guy who has been a rock star. Can I just wax poetic about our beloved Siggy for a moment? "Are you talking about me?" Not only has he carried many riders safely and stood quietly for children to groom him (because Topaz would rather eat the children than be groomed by them), but he is our resident babysitter and buddy for a newbie like Splash. On Splash's second day here, we put him out with Siggy while he got acquainted with everyone else over the fence. He and Sig greeted each other politely and have become fast friends, much to our delight. In return, Sig's gotten extra carrots and is currently basking in his stardom. As everyone gets settled into the new herd dynamic, we take it one day at a time. So far, so good. And in the meantime, Siggy will accept gifts and respond to his fan mail when he's done signing autographs in the barn. I'm the first to admit that I've totally been slacking on my blogging lately. Things are hectic around here, especially with the spring season starting up (I may not be riding, but there's a plethora of things to do! ), I could update on a number of things....but I have to be honest in that pregnancy is kinda boring. No exciting schoolings, clinics or lessons to attend, no events to gear up for, and every beautiful warm day I think, "Oh, I'll have to pop on Zeus and....oh wait. I can't. Boooo." Even though I'm officially in my last trimester and "grounded" from riding at this point, I got to spend this past weekend with Matt and a few other supporters of our local town park, sprucing up the equestrian amenities. 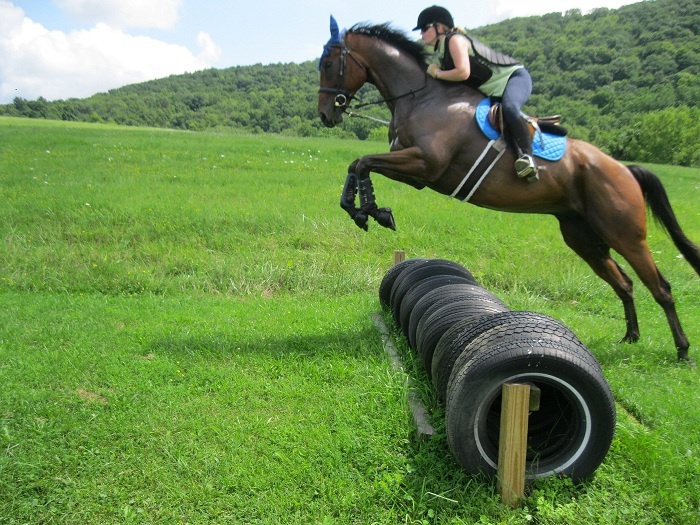 We are super lucky in that our town park has a gorgeous riding ring, trails and galloping paths, and even some XC jumps. Yup. 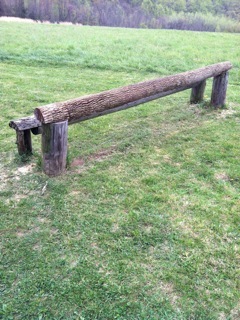 My tax dollars pay for XC jumps. How many people can say that? Mowed galloping paths for miles! But, the amount of daredevils on horseback on our town has dwindled, and so has the care of the jumps and other features we love so much. Enter the Friends of Boyce Park Equestrians, a group of us who ride there regularly and want to make it into a great place to ride again. 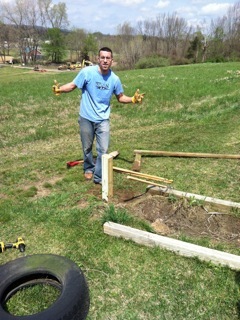 We're hard at work raising awareness in our town and this past Saturday, a bunch of us had a "work day" to improve and/ or fix some of the jumps. That meant bringing a bunch of tools, some lumber and a bit of creativity. 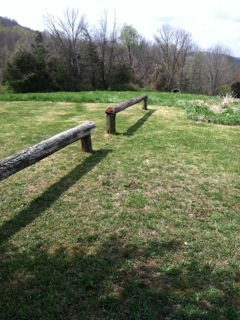 It's a work in progress, but the park is well on its way to being an eventer's paradise once again. Without further ado, here are some of the new additions and renovations, courtesy of hard-working volunteers. More jumps are being added, painted and a dressage arena is in the works, but this is one heck of a good start. And PS - for you non-horse folk who read the blog, I'm very sorry, but photos of barrels and logs excite us horse people to no end, especially when we get to jump over them. 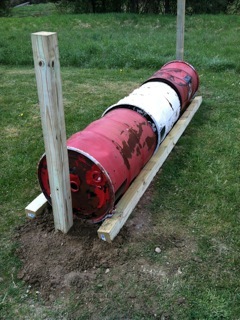 These barrels were pushed off into some brush along a pathway. Enter some standards and a groundline, and we have a nice jump! High Log and Low Log, a bank is being built not too far away. Hopefully people who walk their dogs in the park won't think the bank is a relaxing seat for them, and have a horse barreling up to it. Those of you who wanted a bump pic, voila. And for good measure, I'm standing like a duck. Good Lord, what's wrong with me?? 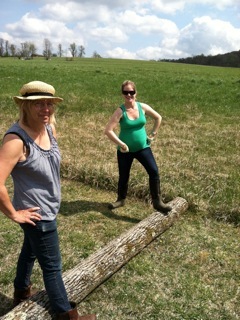 That's Sue H., another volunteer helping me kick a log into place. The sexiest jump builder of all time, Ladies and Gents! This guy did all the hard labor and I got to hold the shovel and point out where things should go. All I had to do was get him a burger and curly fries afterward, and he was happy. 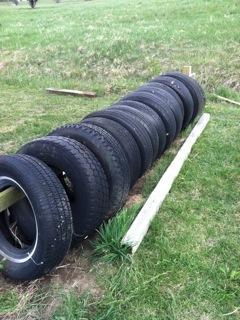 The dilapidated tire jump, 2011. The rebuilt tire jump, 2012. 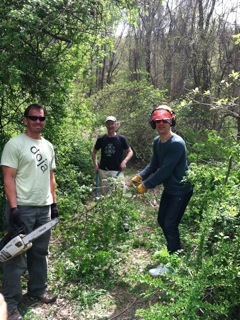 Clearing the trails behind the galloping fields. It was a gorgeous day to get out and make the most of what our town has to offer. Parks like this are few and far between, and part of showing our appreciation is by putting in some time to make it better. Time well spent! It's been a lovely few weeks here at TMF. The grass is beginning to crop up, iris and lilies are peeking through the ground, and the animals are enjoying the weather as much as we are. While I'm entering the last trimester of pregnancy, work around here still has to be done. Luckily, I'm feeling great and have a bevy of helpers. Mojo finds nothing wrong with a cat nap on the outdoor furniture. As I'm wandering by with wheelbarrows and pitchforks, he has the decency to open one eyeball to acknowledge me and say, "Good work, Mom!" You know it's spring when Zeus is at the fenceline in the afternoons, gazing longingly at the house and nickering when we come out. "Time for me to mow the lawn!" I swear he thinks he can use his sheer willpower to coax us out of the house to open the gate and let him graze. Yes, I'm a sucker. Matt's mom brought us a beautiful bassinet that has been in their family for a long time, and our little one will get to enjoy it too. We went out to feed one morning, came back, and someone else decided it was the perfect spot for a morning nap. Monster gives new meaning to the word babysitting....and we'll be making sure he does not actually sit on the baby when she gets here! Ahh, spring. Time to toss some more grass seed out there and hope the wind doesn't take it to the next town over!